Active filter for use with Uptone Audio Regen SMPS Only - Not for use with SBooster BOTW linear PSU. 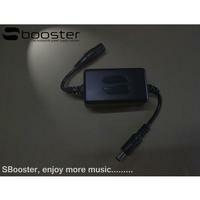 SBooster Ultra upgrade for the UpTone Audio Regen USB HUB. The SBooster Ultra for the UpTone Audio Regen USB Hub is our first switch-mode power supply add on based on active filter technology. Compared to the passive SBooster Single Unit you will get with the Ultra an even greater crispness, tightness, distinctness and focus. Last but not least your Regen will run a lot cooler which has a positive influence on the overall sound quality. The SBooster Ultra for the Regen will be delivered as a plug & play device and requires no technical knowledge. The Sbooster Ultra has to be used in combination with your stock supplied 7.5V Mean Well (switch-mode) adapter. This SBooster Ultra is suitable for an input voltage of 7.5V – 9V and can be powered by a switch-mode adapter, a BOTW P&P ECO 9V-10V, a conventional LPS, a rechargeable battery, a super capacitor solution etc. The only restriction is that the input voltage has to be DC, not AC, and does not drop below 6.75V. The SBooster Ultra upgrade for the Regen is a plug & play addition to your stock supplied Mean Well switch-mode power supply (MW SMPS). The SBooster Ultra uses active filter technology to purify the high frequent ripple and noise of the MW SMPS. Furthermore the Ultra also enhances the poor power characteristics of the MW SMPS completely in order to get the maximum sound quality out of your Regen system powered by a switch-mode concept. With our SBooster Ultra we offer a high performance but still economic upgrade option for your Regen. 3) Lowers the internal power dissipation of the Regen. The internal power regulators of the Regen are running hotter than in our opinion is necessary. Small surface mount (SMD) low drop & low noise regulators generate in general more output noise and become less stable when the temperature goes up. Lowering the temperature of the internal regulators with the SBooster Ultra has a positive effect on the temperature rise of all internal components and therefor lead to an increase of performance.